Work continued Tuesday on the new Sonic Restaurant coming to Washington Court House. According to vice president of operations for the North Fork Restaurant Group, Selina Stanley, the goal is the open the restaurant next Tuesday, with a “grand opening” and ribbon cutting coming in mid-to-late March. The Sonic restaurant in Washington Court House that has been under construction since the summer of last year is expected to open next week. North Fork Holdings took ownership March 6, 2018 of a 1.33-acre site at 403 W. Court St. that is being developed into a Sonic restaurant. In an interview on Tuesday with the vice president of operations for the North Fork Restaurant Group, Selina Stanley, she announced the restaurant may see its opening very soon. Stanley said the business is hoping to hold a more traditional “grand opening” with a ribbon cutting and all, but she wants to wait until the weather is a bit nicer. The plan — according to Stanley — is to hold the event in mid-to-late March with a “fun” day, including roller skaters, which she said would be difficult to have in this kind of weather. Stanley took time to thank the many companies involved with finishing the project, including their landscapers; Custom Lawn Care. She said they have used many local companies for their needs and they have all done a great job. “They are all working hard to get it done, so thanks to all of them,” Stanley said. North Fork Holdings operates 35 Sonic drive-ins, primarily in Ohio, West Virginia, Kentucky and Missouri. The drive-in hours will be from 7 a.m. to 10 p.m. daily, according to Stanley, and will be extended in the summer time to even later. The menu — which was available Tuesday from Stanley — includes many Sonic favorites including the “Sonic Cheeseburger,” chili cheese coney dogs, crispy chicken tenders, boneless wings, all-day breakfast that includes burritos or “toasters,” kids’ meals of several varieties, frozen lemonade, slushes, and hand-mixed classic shakes. The information in this article was provided by Selina Stanley, vice president of operations for the North Fork Restaurant Group. Stay with the Record-Herald for more information as it becomes available. 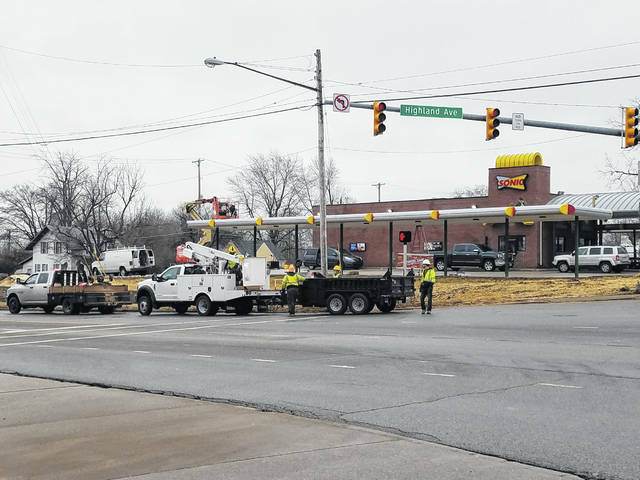 https://www.recordherald.com/wp-content/uploads/sites/27/2019/02/web1_20190205_113522.jpgWork continued Tuesday on the new Sonic Restaurant coming to Washington Court House. According to vice president of operations for the North Fork Restaurant Group, Selina Stanley, the goal is the open the restaurant next Tuesday, with a “grand opening” and ribbon cutting coming in mid-to-late March.